Aggressive debut for new performance shop. Sydney’s greater west has just seen the arrival of a new performance Dojo, Yakuza Motorsports. Dealing only in the best of the aftermarket, their catalogue of inventory includes brands like HKS, Invidia, Takata and many more. Now dealing with YHI, Yakuza Motorsports has added two more premium bands, Nitto & Enkei to their Japanese performance product range for the Japanese Domestic Market. Yakuza Motorsports owner Tony Chirinian has himself a customised Tommi Makinen Evolution 6.5 with a set of Enkei RPF1’s. Sitting really snug, these 19x9.5 RPF1’s with an aggressive 22 offset look absolutely top class. Suited perfectly to match the custom fabrications and the mint paint finish, it comes as no surprise the RPF1 is the number one selling Enkei wheel. 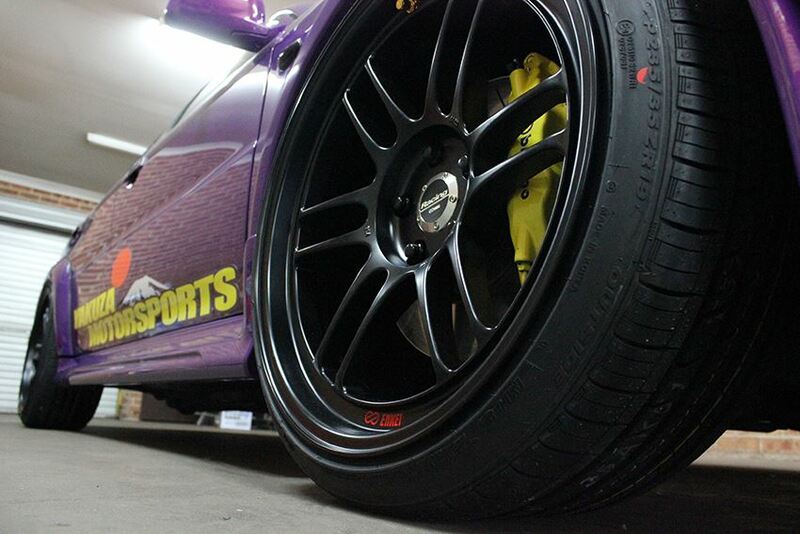 For a show stopper of a ride already, the Enkei RPF1’s simply put the icing on the cake. For all your Enkei & wheel enquiries speak to your local YHI branch or sales rep.
RPF1’s are available in 15-19”, Matte Black, Silver & Gold.